While it’s tempting to stay inside where it’s warm during winter, we all benefit from getting outdoors from time to time, particularly on a sunny winter day. To help you do this and still stay comfortable, here are some tips from Outside Concepts on how to keep your outdoor living area warm. If you’re considering a new outside living area, think carefully about where it’s best to locate it. An outdoor living area on the south side of your house may be great in summer but will be cold and dark in winter. Consider heating options that will take the chill off during cold weather. 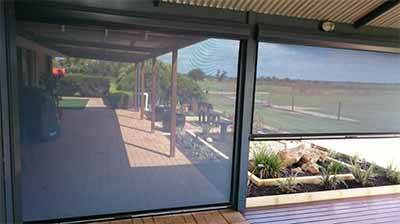 Café blinds can reduce or eliminate a cool breeze and help keep your outdoor living area warm. Rather than completely roofing your outdoor living area, have an open section that’s exposed to the midday winter sun. Polycarbonate roofing and louvered roofing area also worth considering. With some clever plant choices, and particularly with the use of deciduous trees and climbers, it’s possible to create an outdoor area that is cooler in summer and warmer in winter. Put on a warm jacket, scarf and beanie and embrace the cold, even if it’s simply to enjoy a coffee or alfresco lunch in your outdoor area.